This is Part 7 of my trip to Nepal. If you missed the other parts you can find them here. How Much is That Salmonella in the Window? This is Part 6 of my trip to Nepal. If you missed the other parts you can find them here. 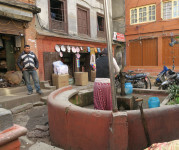 This is Part 5 of my trip to Nepal. If you missed the other parts you can find them here. This is Part 4 of my trip to Nepal. If you missed the other parts you can find them here. This is Part 3 of my trip to Nepal. If you missed the other parts you can find them here.